Couple of weeks ago, upon returning home from a short trip we found our house much too warm and after quick inspection found that central AC was not working. First suspecting blown fuse i went downstairs hoping for a quick resolution. Alas that was not the case. Furnace (serving as the blower) had power and AC was working as i could hear fan outside as well as the coolant running through the pipes. After opening up the furnace i found a board with blinking lights repeating pattern 3 green 1 orange and infrequently changing to 3 green 3 orange. These codes translated to blower motor not running at the right speed or not running at all. Starting a search for the solution on the net I’ve stumbled on this long thread which suggested that this might be due to a failed thermistor and that repair could be as simple as replacing it. Taking the power supply off the motor i was happy to find a charred and broken apart thermistor. This solution was a better alternative to the short-circuit however it reduced the efficiency of the fan essentially by wasting energy in the resistor all the time rather than only during startup as in case of a ICL thermistor. The picture above is after fan has been working for a week or so and you can see those resistors heated up quite considerably and even melted down part of a rectifier nearby. There was also a discoloration on the end of one of the resistors. so i can certainly can’t call it a perfect solution but it worked for me. At the end, the most impressive part for me was the power internet allowing free peer to peer sharing of knowledge. 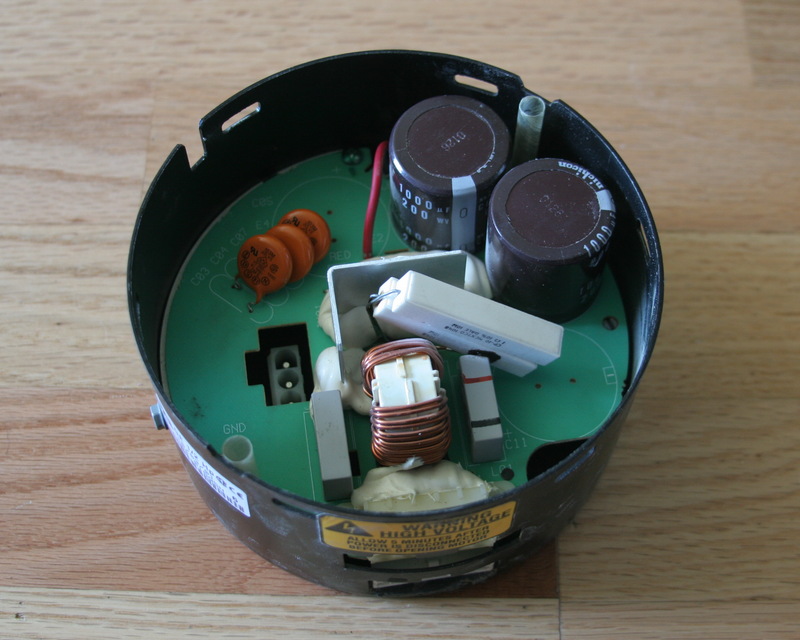 I was pleasantly surprised how easy it was to find this knowledge on the net and how valuable it was – was I call a HVAC technician it would cost me several hundred dollars in replacement power supply or even entire motor. This entry was posted on September 2, 2011 at 1:15 am and is filed under Uncategorized. You can follow any responses to this entry through the RSS 2.0 feed. You can leave a response, or trackback from your own site. Thanks for saving me some time on fixing my motor controller. Will need to wait a few days to get it from Digikey as we don’t seem to have a good parts house here in Minneapolis Minnesota either (at least the part should not take as long to get from central MN)…. I’m an HVAC tech and I just had a bad motor module on a Carrier furnace yesterday. The thermistor that you speak of was bad. As a temporary fix, I tied the two conductors together (as if it were never there) to get them heat for the night. Nearly every company out there will not let their techs solder in a new thermistor because to replace the motor module will make more profit. Also, most techs don’t know how to use a soldering iron for electronics. It might create a problem when something on the furnace control board fails that us techs can’t begin to fix and they see that we fixed someone’s motor module. I think I may start carrying a few of these myself though. Anyhow… you made a good catch that many techs struggle with. Good job! Good job!! I wish there are more technicians like you out there. And another “Thank You from me! I replaced the RTI “Surge Gard” SG348 (1 ohm, 20Amp NTC Thermistor) with a 1 ohm 30Amp version from Ametherm (p/n SL32 1R030; Digikey p/n 570-1059-ND). The 30 Amp version has a higher energy rating and a slightly higher dissipation constant. Actually, since we have two identical HVAC systems (upstairs and downstairs) I bought an extra SL32 1R030 for an expected eventual failure of the SG348 still present in our other furnace. BTW…the Trane brand 115V blower motors (actually from GE) in each system were labeled as Trane Part # D340316P13; Replacement #MOT5432S. The furnaces were built in 1998/1999. 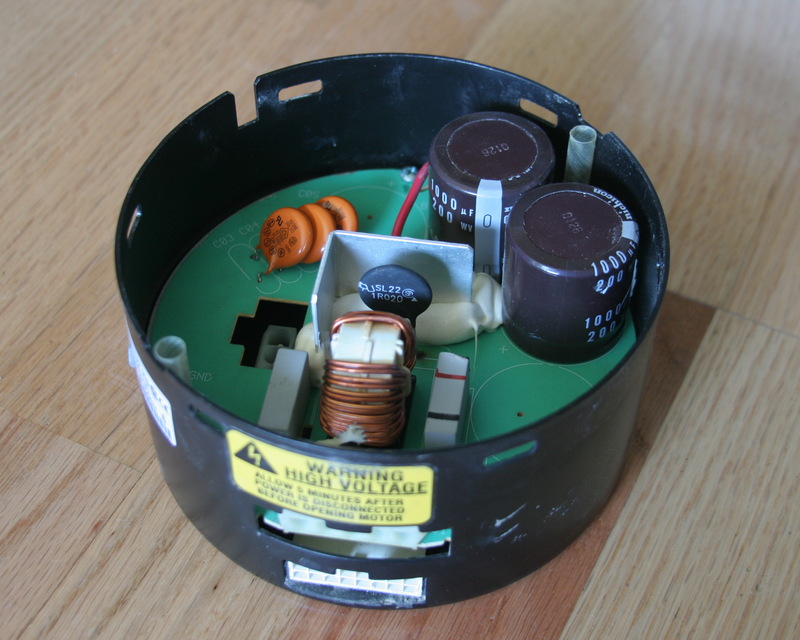 I installed a 1 ohm – 20Amp – version from Ametherm (p/n SL22 1R020; Digikey p/n 570-1041-ND, not the 30 Amp version. I used the 20 Amp version instead of the 30 Amp version after some consideration regarding the normal operating current drawn by the 1/2 HP blower motor (8.0 Amps). The lower resistance (about 0.025 ohms) of the 20 Amp version of the thermistor during continuous running of the motor would dissipate less heat. The 30 Amp part would have a resistance of about 0.05 ohm with a current of 8 Amps running through it. That would mean the power loss in the 30 Amp thermistor would be about 3.2 watts instead of 1.6 watts in the 20 Amp version. I believe it’s little bit more complicated but ends up in favor of 20A thermistor anyway. Resistance is dependent on temperature rather than current and temperature depends on current but also how well component can dissipate heat. To give an extreme example, if you take your 20A thermistor and put it in an ice bath then it’s temperature is not going to raise by much and it is still going to be around 1 Ohm even at 8A steady current. However as the ambient temperature goes up so does thermistor’s temperature which decreases it’s resistance lowering power loss. So at 50c air temperature power loss is 4.15 and 6.63 W for 20A and 30A thermistors. Many thanks. Some of the detail got a bit over my head, but you helped me out… a LOT! I ordered by the thermistor from Digikey. I did call Radio Shack, but the person that answered the phone had never heard the word thermistor. I assumed it wasn’t worth the 10 mile round-trip to look at their shelves. I went ahead and jump’d it (wire – no resistor) while waiting for the new part. I reasoned that if I could get it started once and keep it running (fan forced ON at the thermostat) there wasn’t much risk operating without the inrush limiter. Thoughts? Good idea to keep fan running to avoid on/off switches. Some people say that they run it short-circuited for a while but better safe than sorry. Thanks – I agree on the power of the internet. In less than 30 minutes, this helped me diagnose, order the right part and be able to fix what would have cost me $1500! THANKS!!! Is there any safety exposure to using the 30A thermistor over the 20A thermistor? I am afraid this goes beyond my level of expertise. I would think 30A would be less safe as it acts like a 30A fuse so it will permit constant current up to 30A to flow without burning up which in turn could burn up the motor. 20A thermistor will burn at 20A perhaps saving motor from overload sooner than 30A one. Thanks and I tend to agree with the protection side of it It turns out that I have the 1hp motor and that uses the SG379. In limited searching, I *think* I can conclude that the SG379 is a 30A limiter. Open question; I’m thinking of mounting an automotive fuse socket on the outside and making the thermistor quick change. I realize the first one took over 10 years to blow, but how nice would it be to just remove the compartment cover, yank the dead one and insert a fresh one. I’m wondering though if it has to be in its proper place to function properly. Just had mine replaced, under warranty cost $207 for labor. Replaced entire motor assembly, but I will keep this in mind, for next time. Unit is six years old, and the motor itself looked fine, with no shaft play. Tech said there were bad batches of motors, and this seemed not unusual for him. Wish I could have kept the old one, to inspect closer. I was hoping that this would be the same issue on my motor. Unfortunately upon opening the motor control module, the thermistor looks fine, but the molex connector that connects to the actual motor is all burnt out. It doesn’t seem possible to fix, as the majority of the components within the control module are encased in some sort of potting material. Thank you for your informative post about the (DEAD FAN REPAIR). I also had the same issue with the ECM on my motor on a 6 yr old furnace. After calling a tech to come to tell me it needed a new motor that would cost $1550.00 plus install and for a few dollars more $2000.00 to $2500.00 for a whole new furnace installed!!! This made me think, I spent that money 6yrs ago to buy a so called high efficiency furnace to save money. In 6yrs I don’t think I saved anywhere near that amount, so I turned to the internet and after hours of researching I came by this blog and was happy to find this post which gave me a sigh of relief. The repair will now cost me less than $20.00 and a few hours of my time. Thank you so much!! My furnace went dead over the weekend and I investigated what was wrong with it. After looking into it and online, I found that this was the issue. After looking for a fan motor online, and finding a thermistor, I saved about $698,50… It was a breeze to replace the thermistor. Two thumbs up for your write up!! While waiting for the part I did the same Radio Shack resistor fix you did, except I made a set of longer leads so the resistors could be outside the housing so any excess heat is dissipated in the air-stream (not causing overheating or melting of recitfier). Thanks so much you saved me $1000 right before Christmas…. Just a thought; While i waited for parts, I installed an old multi speed squirrel cage, that, with very few mods, fit my case. the Carrier A/C didn’t mind a bit, I’d imagine the heat would be okay with it also. i just triggered it from the thermostat & included a 24v relay. i just selected an appropriate speed and wired it for that. I’m sure that would knock the efficiency down a bit, but 97% efficient isn’t worth much if you have to throw a grand or 2 at it every few years. I pulled it out when the new thermistor came, and it is back to normal, but if it ever gets to the point of actually needing a whole replacement motor, this will go back in, and see it through its old age. 1. Despite getting decent service from a local HVAC company that was going to have no choice, really, but to charge the arm and the leg, I did get some unsettling information this morning AFTER I had already bought the same exact refurbished Motor & Module off eBay. The technician told me (on the phone) that the Lennox parts plus shop that they buy the replacements from has to program the module before it can be used. He said GE manufacturer it (true) and Lennox buys 'em 'blank' (also…kind of true–but they buy and provide them pre-flashed with the original unit also…err, at least they used to when ours was originally purchased back in '06), meaning that Lennox then has to flash the blank GE module with the Lennox-proprietary program to make the module compatible with the Lennox board and motor. So suddenly, I was like, "Oh crap! Does that mean I just wasted money on the refurbished module because there's a chance it isn't flashed with the Lennox-proprietary program!?" b) The refurbished Motor & Module is waaaay cheaper! hehe, maybe that's the most important? c) The month and day of manufacture is different, but the year of manufacture is the same. d) Because they're from different batches separated by a few months, the serial number/barcode is different. So, basically, there was also the risk that the flashed programming was different…and I had no idea how to tell…hence the call to the eBay seller (who, by the way has very reputable history). Guess what they said? They said that Lennox and the servicepersons *think* that they're flashing it with Lennox-proprietary code. They're not! Haha. It's all the same exact GE programming, but of course they give 'em different part numbers for the different manufacturers. Whew. Anyway, I thought that piece of info might be really interesting to some of you. I'll have to remember to update this post once I get it installed. Oh, by the way, since I don't plan on having to replace the actual motor–but rather just plug in and bolt on the refurbished module–it means I'll have a backup motor AND backup module (with fried thermistor). Since I still have the pack of five thermistors on the way, I'm going to try my hand at replacing the thermistor and reviving my original module. That way, I'll have a backup of the entire Motor & Module. In order to give back to this community, here are a couple of things from me. Finally, I want to also give back to the community by offering one of my remaining thermistors to anyone who needs one! Hey There JD, I’ll take that extra thermistor! Haha, I’m in Canada though, so if you’re in the US don’t worry about it, the shipping probably wouldn’t be worth it. I just had the same problem this past Thursday, Feb 22, when I woke up to -4 F outside! Our T-stat had an error message on the screen saying it had been calling for heat for 2 hours but house temp had gone down by 3 F.
I found the same youtube video you linked above after I had already pulled the motor (Genteq ECM 2.3) & ECM module and noticed the black charring at the back of the thermistor (SL22 1R020). I tested the motor to make sure it was all good (ohmed it out from each phase to ground, infinite resistance on all so that was good, and all of the phases were equal resistances to each other and less than 20 ohm, all we exactly 10.6 ohms in my case). Given the cold temperatures up here, I found a motor tech that was aware of the problem and had 2 thermistors left on hand so he did it of $60 case. But given that it sounds like it’s a common problem, and I can probably expect it to happen again in 1-5 years, I was shopping around for another couple thermistors to have on hand so I can just take it to a friend that solders the next time it happens (or maybe I will have learned by then). Great fix, I was really nervous about it initially, but with each day my confidence grows. Cheapest ECM module that I saw used was in the $200-$300 range, and I don’t even think those were the right ones because my HVAC unit is a little more rare on the market (ADP B-series, not recommended). Cheapest new module probably would have been $500-$600 CAD, if I could even get it, and it sounded like new motors were minimum $800 and I was even hearing $1,200 CAD!!! Plus the price of a service tech… I was thrilled to do this one on my own! Best place to shop for these thermistors is DIGI-KEY ELECTRONICS . That thermistor is about $2.00 I received mine in 4 days. Hope that helps. Thanks again to the original poster John!! They are $2.19 each. I think I bought 10, with shipping it was still under $40.00. Really glad you got it fixed, John! You’re probably right about shipping from southern California to your location in Canada, but my offer still stands for whomever might want to take advantage of it! Thanks to Rob for the source link and pricing info. I just ran into this very same thing and my temporary solution was to solder a wire jumper in place of the thermistor. I kept the blower spun up by hand as the blower came on to limit the current spike. Set the thermostat to Fan On until the new thermistor arrives. Hopefully we don’t have any power failures in the next few days!